Even though the groundhog in Pennsylvania forecasted an early spring, the deep freeze continues from the Midwest to the Atlantic. Though track activity has been spotty, the harness game toughs it out. This weekend, Feb. 11 and Feb. 12, the Meadowlands’ winter series goes on with Friday’s second legs for the pacing mares in the Cape & Cutter Series (C&C) and the four-year-old-and-under colt and horse pacers in the Exit 16W Series. The on Saturday the Aquarius Series presents its second leg at the Meadowlands for four-year-old open pacers. Remember that at the Meadowlands through February, the guarantee on the Saturday night Pick 4 is $100,000. The Pick 4 features a 15-percent takeout. And on TwinSpires, all winning tickets include a bonus of 10-percent if hit from our site. This week we have the correct races for the Cal Expo no-takeout late Pick 4 on Saturday’s program. Our weekly coverage of the four events of the bet have produced strong contenders and high-priced winners, so we urge you to consider choices for win wagers, also. On Friday, Feb. 11, there is only one division of the Exit 16W. Summer Camp comes off a huge mile in the first leg last week. He won it in 1:49.3, a lifetime mark. After that event, Summer Camp will most likely be favored in this leg with the second choices being the four coupled horses trained by Ron Burke. Watch out for Sniper Seelster. He made a huge closing move last week, picked up cover and finished fourth, but he is coming off the 1:49.3 mile by Summer Camp. Also watch out for leg-one winner Thunder’s Fury. In Friday’s opening division of the C & C, Red Star Hottie comes off a win in the first leg, a 7-1 upset. Last week we gave out Shacked Up and she could win it. She just couldn’t catch “Hottie” last week. Also watch Jasperthat A. In the second division, Laughandbehappy might seek revenge after just being caught in last week’s mile. Shangai Lil tried to close but finished third. Also watch Go On BB. She finished second, in front of Laughandbehappy. Saturday, in the first Aquarius division, Foreign Officer looks for wins in both rounds. He will be one to watch next to Whisky Pete. Foreign Officer was in the thick with the major three-year-olds last year and as been good so far at four. In the second division of the Aquarius, He’s Gorgeous is making his four-year-old pari-mutual debut. He is a dangerous contender. Also watch for Malicious. He was caught up front last week and could probably close strongly here. Entering the second Saturday of the $100,000 guaranteed Pick 4 with a 10-percent bonus if wagered on Twinspires.com, here are our suggested contenders. Race 6—(1) Spy N; stepping down from two races in higher company, he won in cheaper company and could be good in this event. (2) Noble Falcon; won ina lower class a couple of weeks ago and now is moving to the inside since that start and could be dangerous. (7) Blatantly Good; steps down from stakes action vying for his first 2011 victory. Race 7—(5) Toucam Sam; he had a good trip last week and could race even better. (6) Shadows Dream; he also a good trip last week, finishing behind Toucam Sam for third. Race 8—(1) Cinderella Guy; the only one in this field that showed some potential, winning in a lower condition, but is stepping down. Could be a danger. Race 9—(2) Don’t Fool Me Now; steps down to the claiming ranks, though he won in higher competition earlier this year. (10) JL’s Man Of Action; he has been on the board every start this year and has also proven talented in this company; tough to beat. The ticket using just these horses is $12. Four full fields make up the no-takeout late Pick 4 at the Sacramento oval this Saturday. Again, we opt for a smaller ticket, one with the strong contenders that are likely to go off at odds higher than their chances. Here are the horses we suggest you consider on your ticket. Race 10 – Cruiserluckyseven showed a lot last week, hung wide second early and still gaining strongly after getting a midrace breather. El Real Grande was three wide trying to hold the lead and was done by the half, but he should be gunning tonight and a smoother trip puts him in the mix. Race 11 – Two winners from last week return in this field but the outsider is Misdori. At 20-1 this one was blazing in the stretch. Saving ground here early may be the key to making a close like that work to win. Race 12 – The Goose won by 7 lengths last week in a similar trotting mile. But I wouldn’t leave out Dani California, a beaten favorite that raced better than the loss delivered last week. Meringe closed well at 3-1 and could be the big overlay. Race 12 – This week, Hell And Damnation may very well burn this field to a crisp from post 2 and could be overlooked since Mad River Hanover looms as the public’s big choice. If you want to use three in Race 12, our ticket is $24. If you feel brave, leave out The Goose and it costs $8. 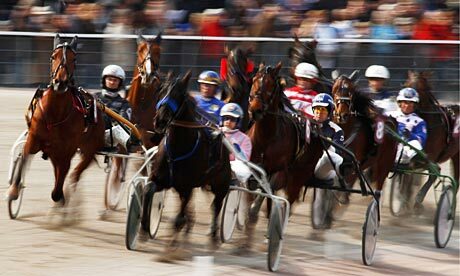 Northlands Park began racing in 2011 for 46 days of harness through Feb. 26, on Fridays and Saturdays. But most exciting is the news about exotics. Northlands offers a $25,000 Pick 6 Fridays. The races start at 6 p.m. (MT). If there is a winning Pick-6 ticket and there isn't $25,000 in the Pick-6 pool, an insurance policy will cover the difference. If there are multiple winning tickets, the pool will be divided equally among winners. At The Meadows on Feb. 11, we are considering five horses. In Race 2, Stentorian (5); in Race 7, Andovermetreasure (3); in Race 8, RC Curiosity (6); in Race 9, Summer Hope (1); and in Race 13, Twin B Caviar (8).